Our Ruby table is a stylish extension table that starts off as a compact 65cm square garden dining table, but doubles in size with a few quick adjustments. The glass table top looks sleek alongside the aluminium frame and legs, meaning it is ideal to spruce up your garden, patio or decking. 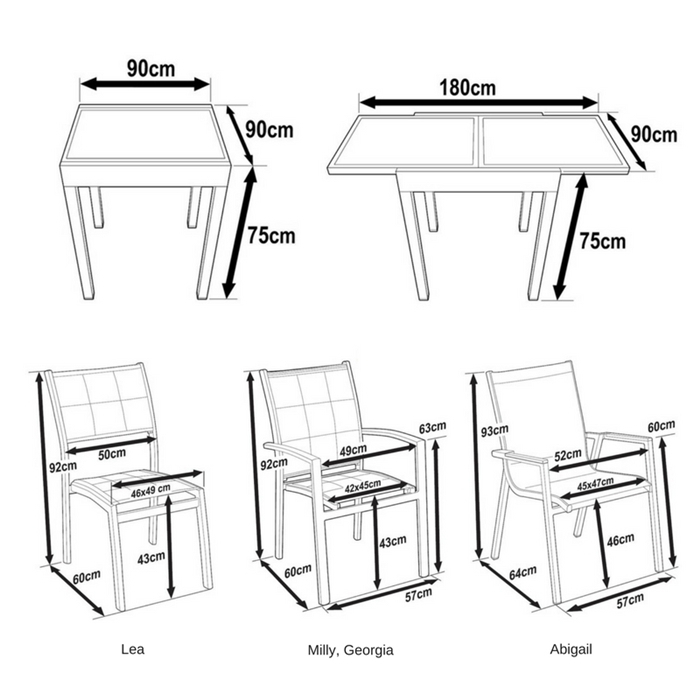 The Ruby is a sturdy, but lightweight table that weighs a mere 26kg which means moving it around is hassle-free. Perfect for casual outdoor dining and larger hosting requirements the Ruby table is a dynamic table model. Choose from the range of chairs we have available to complement and customise your purchase of the Ruby table. Our beautiful Ruby table & 6 chair set in Black will radiate elegant modernity into any environment, indoors or out. If you're looking to go a shade or two brighter, check out Ruby in smooth Grey, cool White & Grey or lavish White & Champagne. Don't forget to look at our gifts section above where we offer amazing discounts of 30-70% on a wide range of products to complement your purchase of the Ruby table set. Lazy Susan tables are made with high-quality sand-cast aluminium which has many advantages over other models of garden table because it will not rust, or rot even in the harshest of British winters. If you're looking for a furniture set that will remain beautiful years after purchase with no maintenance, then look no further. At Lazy Susan we are always happy to help answer any customer questions or queries, and to take orders directly from customers over the phone. Please do not hesitate to contact us! We can be reached by calling 01243 71797, or by email at [email protected]. Our friendly, helpful customer service team aims to answer all emails within 2 hours during normal office hours. On specific request, samples of our cushion colours and metal table colours can also be sent out by post to help you further explore the options we have available. If you would like to request a sample, please fill out our sample request form. Lazy Susan are happy to offer free delivery on all products whenever possible, so there are no surprise additional charges at checkout. At checkout you can state any delivery preferences in the "comments" box which will be communicated to the courier. Sale - Buy now to lock in our low price. Available for immediate delivery.